MILES... 55 KM...WEST-NORTHWEST OF GUANTANAMO CUBA. THIS GENERAL MOTION IS EXPECTED TO CONTINUE FOR THE NEXT 24 HOURS. TODAY AND POSSIBLY EMERGE OFF THE NORTH COAST OF CUBA TONIGHT. WHEN THE CENTER MOVES OVER THE WATERS TO THE NORTH OF CUBA. ARE POSSIBLE OVER THE SOUTHERN BAHAMAS. TOWARD...NORTHWEST NEAR 10 MPH. MAXIMUM SUSTAINED WINDS...40 MPH. TROPICAL STORM WARNING AND A HURRICANE WATCH ARE IN EFFECT FOR ALL OF THE CAYMAN ISLANDS. 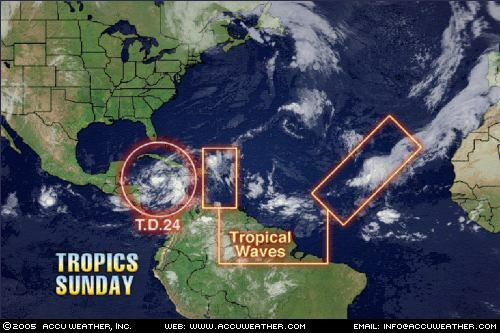 Tropical Depression 24 continues to swirl in the northwestern Caribbean. As of 2:00 a.m. EDT Monday, the center of Tropical Depression 24 was located near 17.4 north and 79.6 west, or about 170 miles southeast of Grand Cayman. 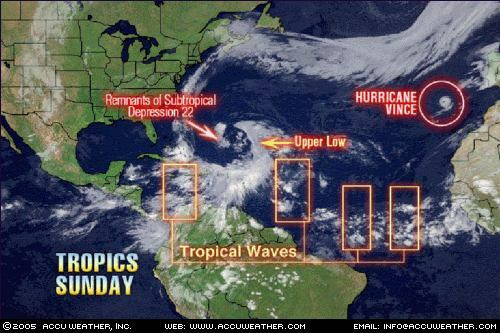 Currently, the depression is drifting to the west-southwest at 2 mph. Maximum sustained winds are 35 mph, and the estimated minimum central pressure is 1000 millibars or 29.53 inches. A large area of disturbed weather extending from near Bermuda into the northeast Caribbean is being caused by an upper-level low pressure area located between Puerto Rico and Bermuda. This upper-level low will move northward. A broad area of surface low pressure over the Bahamas will spilt into two parts. The main low pressure area will accompany the upper-level low and move northward while another low breaks off and moves into the central Caribbean. The surface low accompanying the upper-level low might become a non-tropical storm by the middle of this week. There is some concern that if this low does become a "subtropical storm" it could evolve into a more tropical system later in the week as it moves closer to the New England coast. A large surface high building eastward into the Maritimes of Canada contrasting with this surface low will create strengthening winds and increasing surf during this week. This could lead to tidal flooding and beach erosion along the middle and northeast Atlantic coastal areas. All boaters, especially fisherman should take the evolution of this storm very serious. Long range computer models suggest this system could turn into a very large storm that might have both tropical and non-tropical characteristics. These kinds of storms can create phenomenal waves and very large swells for days. Elsewhere in the tropical Atlantic Basin, we are keeping an eye on tropical waves along 32 west, 44 west, 55 west and 84 west. All waves are generally south of 20 north and are moving west at about 10-15 knots or 4-6 degrees longitude per day. 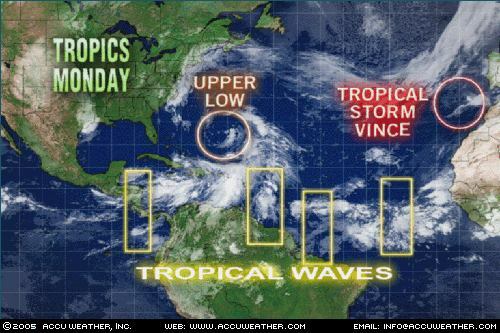 The large upper-level low north of Puerto Rico is creating too much westerly flow in the southwestern Atlantic and over the eastern Caribbean to allow these waves to develop. SAN ANTONIO, Texas (AP) -- Military officials told President Bush on Sunday that the U.S. needs a national plan to coordinate search and rescue efforts following natural disasters or terrorist attacks. Bush said he is interested in whether the Defense Department should take charge in massive national disasters. How Do You Pay For a House that No Longer Eexists? Preliminary reports indicate that many New Orleans homeowners don't have financial protection in case of flooding, which isn't covered by most home insurance providers. If insurance can't pick up the slack, do you still have to pay a mortgage on a house that no longer exists? And if so, how? Most mortgages must be paid back in full—whether you pay out of pocket or an insurance agency covers you. Bankrupt individuals, however, are exempt from payment. More commonly, aid is sought from the Federal Emergency Management Administration. The first step to receiving FEMA assistance is to register your personal information with the agency via telephone or this Web site. Applicants must provide their Social Security number, insurance status, and family income, and FEMA asks that individuals provide as much contact information as possible, such as mailing address and phone number. FORT COLLINS, Colo. (AP) - Amid the unfolding disaster left by Hurricane Katrina, Colorado State University researchers said Friday they expect more storms over the next two months. "The very active season we have seen to this point is far from over," researcher Philip Klotzbach said. "We expect that by the time the 2005 hurricane season is over, we will witness seasonal tropical cyclone activity at near-record levels." The simplest kind of gauge measures the height of a float in still water. A submerged column surrounds the float and prevents choppy waves from creating sudden fluctuations in sea level. The gauge keeps track of the float as it drifts up and down throughout the day and records its height (with respect to a land-based bench mark) at regular intervals. More advanced instruments use sound waves or pressure to measure the same thing. Changing tides and weather conditions can also create dips and swells in local tide-gauge readings. Since local readings can fluctuate so rapidly, most descriptions of "sea level" refer to an average value measured across many years. First, readings are collected over an interval that takes into account regular tidal patterns. (A standard 19-year cycle covers a full cycle of Earth-Moon and Earth-Sun interactions.) Then researchers filter out some of the short-term influences on the data, like extreme weather patterns and storm surges. The readings are averaged together to produce a "mean sea level" reading for a specific station or group of stations in a region. As determined by nearby tide gauges, much of New Orleans sits below the mean local sea level. On Monday morning, with Hurricane Katrina coming on shore on the Gulf Coast, MSNBC's Sean McLaughlin demonstrated the concept of storm surge. To read an excerpt of his demonstration, continue to the text below. To watch the video, click on the "Launch" button to the right. Let's talk about storm surge. It's the number one cause of all deaths associated with hurricanes. Ninety percent of all deaths occur during the storm surge. One thing to compare it to is when you splash your kids in the pool, you push the water forward -- that's storm surge. Your hands pushing the water forward are exactly what hurricane winds will do at the surface of a storm. If we look at the topography of New Orleans. It's a city inside of a bowl with the seawalls, levees and pumps keeping the water out. Most of New Orleans is anywhere from 6-10 feet under sea level. Six feet was the storm surge for Hurricane Charley, and many of you saw the kind of devastation that caused in Punta Gorda, Fla.
Seventeen feet was the storm surge of Hurricane Andrew. From the floor to the ceiling at MSNBC's studios -- that's the wall of water that we could be talking about in certain areas. With the strength of Katrina's winds, the storm surge could go in as far as 500 yards to a quarter or even half mile from shore. The water will not just go away once it hits, especially in a place like New Orleans. If the pumps get completely overrun ... it would just stay there and gain pollution, gasoline, oil. They were talking about how coffins could be unearthed from cemeteries. It would be an absolute mess.